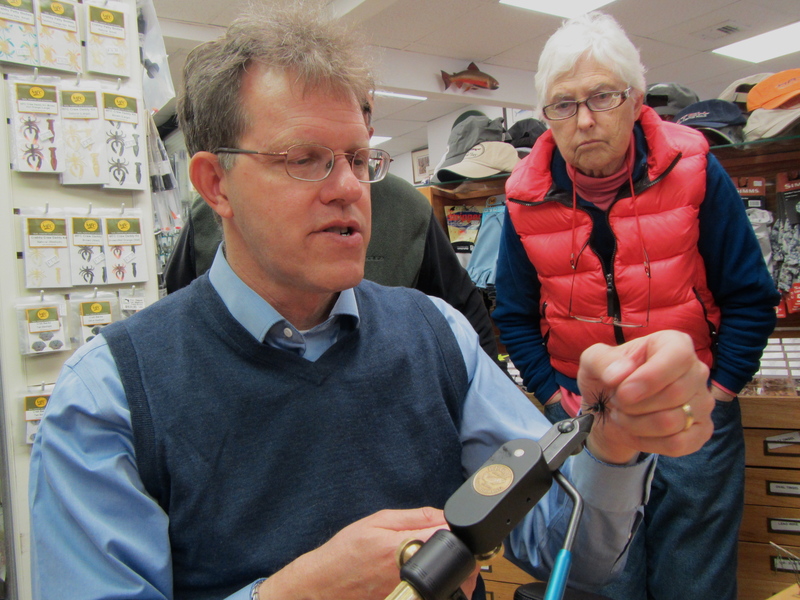 Saturday’s tying demo — Soft-Hackles and Fuzzy Nymphs for Steelhead — was a tremendous success. I’m always surprised by the number of people who are willing to come out and watch someone else tie; the fact that it was me who was tying made me smile even more. I think what I like most about these events is the open forum format. It’s an ideal way to talk fishing, fly tying, answer questions, and connect with people on a more personal level. I appreciate the audience that the internet provides, but nothing beats good old-fashioned face-to-face time. Then there’s the venue. If you’ve never been the Compleat Angler (541 Post Road, Darien, CT) it has a tremendous selection of fly tying materials. I went on a little walkabout through the store after my session, and saw lots of covet-worthy stuff. The staff is great, and Scott, bless him, brought me a turkey sandwich. Man does not live on soft-hackles alone, or: A fed tyer is a happy tyer. Tying Dave Hall’s Black Crawler. That’s Carol off to the right. She’s been to every one of my demos at CA. Thanks for coming out, everyone. My next appearance will be this Wednesday, March 4, at the FVTU Chapter meeting, 7pm, at the Whinstone Tavern at the Stanley golf course in New Britain. “Wet Flies 101.” Hope to see you there. I have not disappeared (like this brown is about to). On Wednesday night, February 26, I will be presenting “Wet Flies 101” to the Narragansett Trout Unlimited chapter. You can get directions from their website (tu225.org). 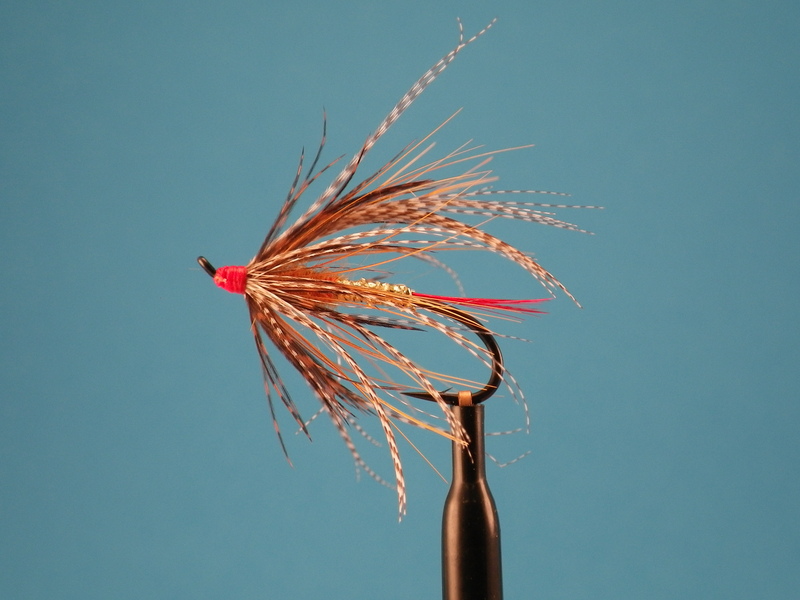 Saturday, March 1, I will be at The Compleat Angler in Darien, CT, from 10am-2pm to present a tying demo, “Flies for Small Streams.” I will be covering wets, nymphs, dries, and streamers, along with tactics and presentations. Directions at compleatangleronline.com. 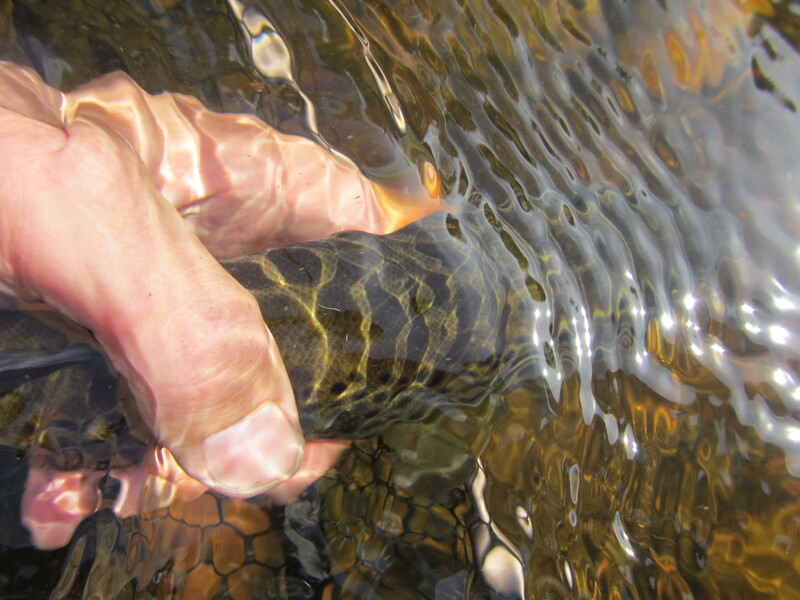 Last but not least, I just finished an article for American Angler on matching the hatch with wet flies. It will be in the spring trout issue.